Ten million years ago, a green and black snake lay coiled in the Spanish undergrowth. 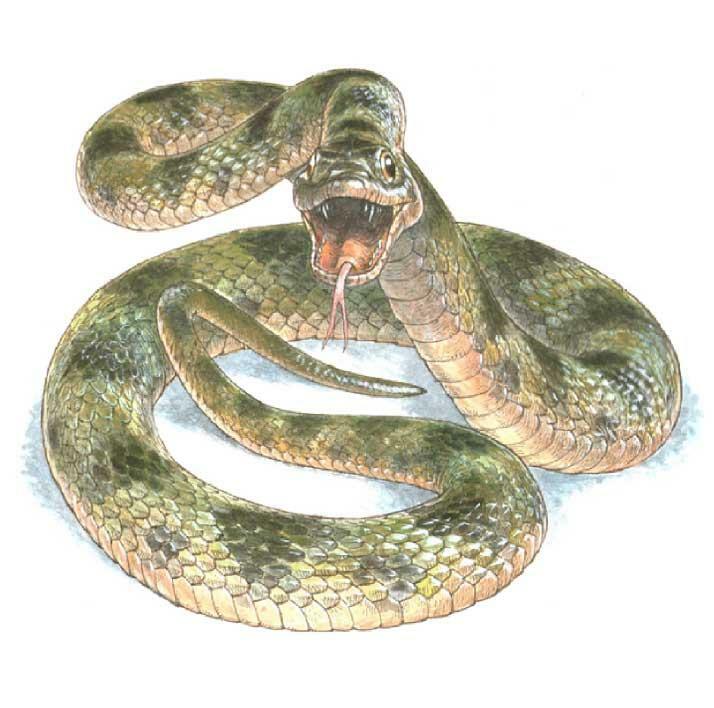 Once, paleontologists would have been limited to the knowledge they could glean from its colorless fossil remains, but now they know what the snake looked like and can guess how it acted. 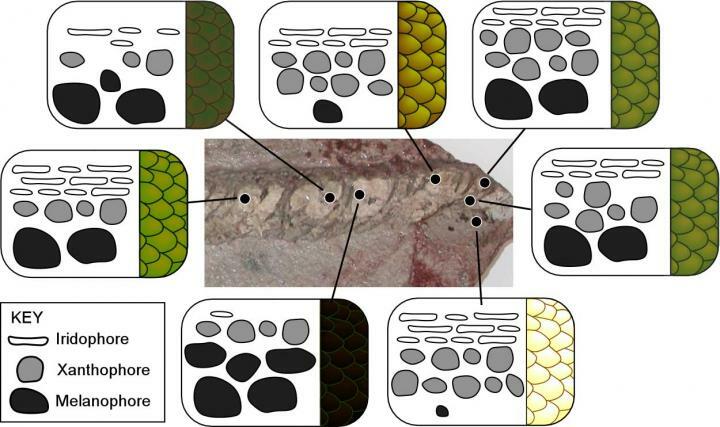 Researchers reporting on March 31 in Current Biology have discovered that some fossils can retain evidence of skin color from multiple pigments and structural colors, aiding research into the evolution and function of color. So far, scientists filling the ancient-Earth coloring book with pigment have been limited to browns, blacks, and muddy reds when melanin lasts as organic material. No other pigments have been shown to survive fossilization. But this snake's skin was fossilized in calcium phosphate, a mineral that preserves details on a subcellular level. The fossilized snakeskin maintained the unique shapes of different types of pigment cells, which would have created yellows, greens, blacks, browns, and iridescence while the animal was alive. The pigments themselves are now decayed, but with the cell shapes--specific to each kind of pigment--mineralized, there's enough information to reconstruct their colors. "When you get fossil tissues preserved with this kind of detail, you're just gobsmacked when you're looking at it under the microscope," says first author Maria McNamara, a paleobiologist at University College Cork. "I was astounded. You almost can't believe what you're seeing." McNamara first came across the fossilized snake while conducting her PhD research on fossils from the Libros site in Spain, but she only recently analyzed the specimen. Her team discovered the mineralized skin cells when viewing the fossil under a high-powered scanning electron microscope and then matched the shapes up with pigment cells in modern snakes to determine what colors they might have produced. "For the first time, we're seeing that mineralized tissues can preserve evidence of color," says McNamara. The researchers determined that the fossilized snakeskin had three types of pigment cells in various combinations: melanophores, which contain the pigment melanin; xanthophores, which contain carotenoid and pterin pigments; and iridophores, which create iridescence. All told, the snake was a mottled green and black, with a pale underside--colors that likely aided in daytime camouflage. "Up until this discovery, the only prospect for skin color being preserved in fossils was organic remains related to melanin," says McNamara. "But now that we know color can be preserved even for tissues that are mineralized, it's very exciting." Calcium phosphate mainly shows up in fossil bones and shells, but records do exist of so-called phosphatized skin. This discovery opens the door for re-analysis of these fossils, occurring across a wide range of creatures and locations, for evidence of color preservation. And knowing the color of an animal can also clue researchers in to some aspects of its behavior and evolution. "It'll mean re-evaluating a lot of specimens that might have been overlooked," says McNamara.